Dr. Gonçalves is a Professor, Department of Obstetrics and Gynecology, Division of Fetal Imaging and a Professor, Department of Radiology; Dr. Espinoza is an Assistant Professor, Department of Obstetrics and Gynecology, Division of Fetal Imaging; and Dr. Bronsteen is an Attending Physician, Department of Obstetrics and Gynecology, Maternal Fetal Medicine, Division of Fetal Imaging, at Oakland University William Beaumont School of Medicine, Rochester, MI. 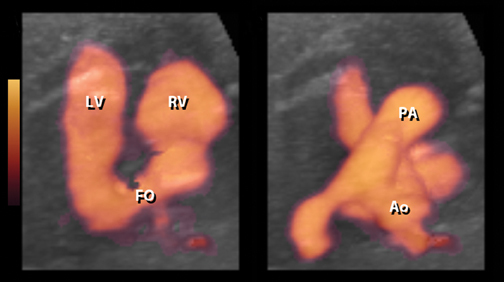 Another recent development, 4-dimensional ultrasonography (4DUS) of the fetal heart, may reduce operator dependency and improve the diagnostic accuracy for CHD.10-16 4DUS allows examination of volume datasets of the fetal heart using standard planes of section and rendering techniques. 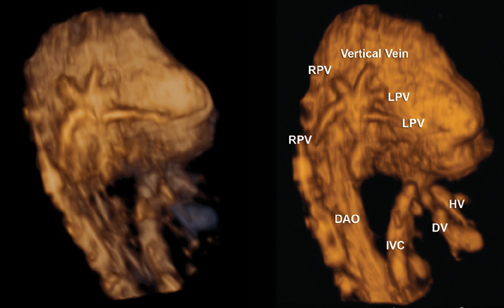 In this article, we explore the available technology to perform 4DUS of the fetal heart, tips for volume acquisition,techniques to visualize standard planes of section, as well as techniques to obtain rendered views of the great arteries and major veins. We also review previous studies that addressed how often good volumes can be obtained in the clinical setting and the diagnostic accuracy of4DUS to diagnose CHD. The term 4DUS implies that the temporal dimension (motion) has been added to the 3 spatial dimensions of a volume dataset.17 For volume datasets acquired from the fetal heart, this means that a virtual beating heart can be examined off- or online, resliced in any plane of section, or reconstructed using rendering techniques, thus providing the examiner with both structural and functional information.18 For example, a 4DUS volume dataset of a fetus with tricuspid insufficiency acquired with color Doppler shows not only the tricuspid valve but also the regurgitation jet that establishes the diagnosis (Figure 1). This would not be possible with static 3-dimensional (3D) volume datasets. Most commercially 4DUS transducers available today rely on mechanical volumetric acquisition. These transducers rely on a 2-dimensional (2D) convex array mounted on a mechanical wobble and are similar to those used for 3-dimensional ultrasonography (3DUS) of other body parts (Figure 2). Once volume acquisition begins, the probe automatically sweeps through a region of interest (ROI), which is predetermined by the examiner, and a series of consecutive 2-dimensional images are reassembled into a final volume dataset. In order to incorporate the temporal information that is present during acquisition, gating technology is necessary. Gating allows synchronization of spatial information to the specific phases of the cardiac cycle, at which images are acquired. In adult and pediatric echocardiography, the electrocardiogram (EKG) is used for prospective gating. In fetuses, we use retrospective gating provided by a technology known as spatiotemporal image correlation (STIC). STIC relies on temporal Fourier analysis to estimate the fetal heart rate from systolic peaks that can be identified in the raw volume dataset.19 Once the heart rate is known, frames acquired from different spatial positions but during the same phase of the cardiac cycle are merged into one volume dataset. The process is repeated for each phase of the cardiac cycle until a seriesof volume datasets are organized in sequence and played as an endless continuous cine loop (Figure 3).13 STIC volume datasets can then be examined on- or offline using one of several volume manipulation techniques that are described later in this article. Four-dimensional fetal echocardiography can also be performed using electronic matrix array technology. Matrix array probes allow realtime 4-dimensional (4D) echocardiography and have been used mostly in adult and pediatric patients, with fewer articles describing fetal imaging applications.20-27 Matrix array probes are designed as 2D arrays of transducer elements (currently up to approximately 9000 elements) that can be fired either simultaneously or in sequence. When fired simultaneously, a pyramid of ultrasound is produced and real-time 3D examination of cardiac structures is possible. The examiner can also control the aperture angle of the transducer by determining how much of the matrix is active at any time. A narrow aperture angle produces a narrow pyramid of sound with a high frame rate and the opposite occurs when the full array is used. If each line of the array is activated in sequence along the elevation plane, 4DUS volumes of the fetal heart can be generated using STIC technology, at much faster acquisition speeds than currently possible with mechanical probes (Figure 4). The same limitations that an examiner faces when performing a 2-dimensional ultrasound (2DUS) examination of the fetal heart apply to 4DUS. These are related to poor image quality from maternal obesity, scars from prior surgeries, artifacts from unfavorable fetal position(spine up), and excessive fetal motion.28 Therefore, image optimization prior to volume acquisition is essential to obtain diagnostic quality volume datasets. The examiner should favor transducers with the highest possible frequency. Harmonics may help in case of maternal obesity. It is also best to use high contrast and low persistence settings as well as a narrow sector angle to maximize the frame rate. Magnification should be such as to display only the structures of interest. A few reminders are important prior to volume acquisition. The first is that volumes acquired from axial images of the fetal heart are optimal for examination of the 4-chamber view, 5-chamber view, or 3-vessel and trachea view. In contrast, if the examiner is interested in reconstructing the aortic arch, the ductal arch, or the venous return to the heart, sagittal acquisitions work better.18 This is a consequence of the anisotropic nature of the volume datasets obtained with current technology, with most of the artifacts presenting in the sagittal and coronal reconstructed planes. The ROI to be included in the final volume dataset should also be as narrow as possible to maximize the frame rate and temporal resolution. This is particularly important for acquisitions performed with color or power Doppler, since these technologies have a negative impact in the frame rate. The most important aspect of volume acquisition, however, is a good acoustic window to the fetal heart. Ideally, once the examiner obtains a good quality image of the 4-chamber (4CH) view, the ROI is quickly selected and volume acquisition is initiated. Although most examiners have a tendency to begin volume acquisition only when a good 4CH view is obtained, this is not really necessary. 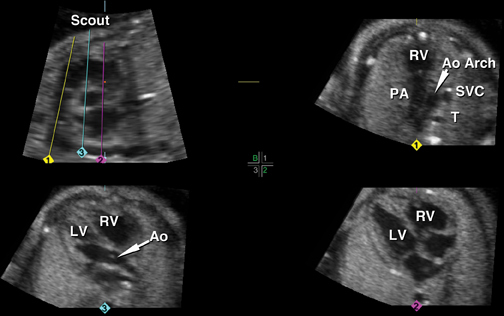 Regardless of the plane of section displayed on the 2D image, all it takes to obtain a diagnostic-quality volume dataset is a good acoustic window to the fetal heart in a fetus that is relatively still. If the fetus moves significantly, artifacts may make the final volume dataset unusable for diagnostic purposes. In this case, the only solution is to stop the acquisition and initiate a new one, repeating the process as many times as necessary until a diagnostic-quality volume dataset is obtained. Another factor that may contribute to motion artifacts in the final volume dataset is heavy maternal breathing. We customarily ask the mothers to briefly suspend breathing during acquisition. This is usually well tolerated, particularly if acquisition time is kept short. Acquisition time is the amount of time that it takes for the probe to sweep through the ROI, ranging from 5 to 15 sec formost ultrasonographic equipment manufacturers. One should keep in mind that, whenever possible, longer acquisitions are preferred since the spatial resolution of the final volume dataset will be better, except when there is excessive fetal motion or maternal breathing. first and early second trimester), and larger angles for older fetuses (eg, 25-35 degrees for late second and third trimester). Volume datasets may be acquired with color Doppler, power Doppler, or B-flow imaging.29-32 Any of these technologies provides a “virtual contrast” to reconstruct cardiac chambers, vessel lumen, as well as physiologic or abnormal shunts. The advantage of color Doppler is that blood flow direction and velocity are present in the volume dataset (Figures 1 and 5). The disadvantages are poor sensitivity to small blood vessels and the dependence on an optimal insonation angle (close to 0 degrees). With power Doppler, sensitivity to low-velocity blood flow is better than with color Doppler, at the expense of no velocity or blood flow direction information (Figure 6).Both color and power Doppler suffer from problems related to low frame rate and poor temporal resolution. B-flow is a relatively novel imaging modality that allows blood flow mapping without Doppler (Figure 7). Although the technology does not provide information regarding velocity or direction of blood flow, it is extremely sensitive to low-velocity blood flow. Since this technology relies on B-mode to map blood flow,excellent acoustic window is required for optimal B-flow imaging. Our anecdotal experience is that rendered images of ventricular chambers and vessels performed with this modality are of higher quality when obtained the second trimester of pregnancy as opposed to later, probably as a result of less acoustic shadowing. The easiest way to explore a 4DUS volume of the fetal heart is to scroll through the original plane of acquisition or use multiplanar reformatting to display the structures of interest. The multiplanar display of most commercially available equipment usually demonstrates the original plane of acquisition in one panel (eg, the upper right corner), with orthogonal sagittal and coronal reconstructed planes displayed in additional panels (Figure 8). A reference dot or crosshair representing the intersection in space of the 3-orthogonal planes is shown in all images. The examiner can drag this reference dot on the screen to navigate through the volume dataset and simultaneously show the same structure in multiple planes. The atrioventricular junction is examined next. If concordant, the morphologically left atrium connects to the morphologically left ventricle, and the morphologically right atrium to the morphologically right ventricle. The moderator band helps to identify the right ventricle. Additional landmarks include the more apically inserted tricuspid valve and chordal attachments to the ventricular septum(Figure 9). The left ventricle is smoother, does not have a moderator band, and the mitral valve only has chordal attachments to the free wall. The ventriculoarterial connections are checked next. Here is where 4DUS can really help. 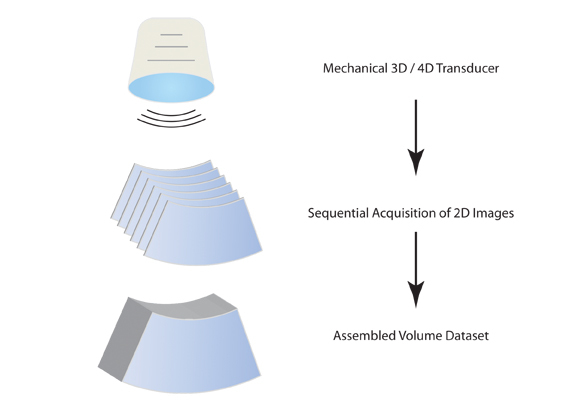 Several techniques that rely either on multi-planar display (“three-step”,13, 15 “spin”,11 “tomographic ultrasound imaging”,38-40 STAR,41 FAST42) or rendering algorithms have been described to consistently obtain the outflow tracts from volume datasets acquired from the 4-chamber view. Regardless of the technique, the goal is to demonstrate that the aorta connects to the left ventricle and that the pulmonary artery connects to the right ventricle (Figures 5, 6,and 10). The pulmonary artery crisscrosses over the aorta as it leaves the heart and should be followed to its bifurcation and to the ductus arteriosus. The ascending aorta should be followed to the aortic arch. The next steps are to check the venous connections to the atrial chambers (pulmonary veins to the left atrium and IVC and superior venacava to the right atrium), double check AV valve morphology, and determine if there are any defects in the ventricular septum. As mentioned previously, a variety of techniques have been published to explore volume datasets of the fetal heart obtained withSTIC.11,13,29,30,31,38-42 A detailed description of each technique is beyond the scope of the article and the reader is directed to the original references for a more detailed description of each. Here we will focus on those techniques that we are more familiar with and, therefore, use more frequently in our clinical practice. This is a simple technique that can be used to explore the full length and anatomical relationships of any cardiac structure.11 The basic principle is that once the reference dot is anchored in the structure of interest and the volume dataset is rotated around its y- or x-axis, the structure “opens up,” depicting previously hidden anatomical relationships with other structures. Figure 11 illustrates the spin technique applied to a cross-sectional view of the fetal chest at the level of the 3-vessels and trachea view. Note the extra-vessel located to the left of the pulmonary artery/ductus arteriosus, which is marked with a question mark. Once the reference dot is placed on that vessel and the volume dataset is rotated around the y-axis, it becomes clear that the vessel in question is a persistent left superior vena cava draining to a dilated coronary sinus. This technique allows simultaneous visualization the long-axis view of the left ventricular outflow tract and the short-axis view of the right ventricular outflow tract in 2 separate panels displayed on the same screen. The technique works best when the original plane of acquisition is axial with full description and illustration provided in Figure 10. We have previously shown good inter-and intraobserver reproducibility for this technique.43 More recently, Rizzo et al15 reported reasonable diagnostic accuracy for this technique to diagnose conotruncal anomalies among examiners who were blinded to both indication and final diagnosis. In his study, volume datasets of the fetal heart were obtained from 112 consecutive unselected and 10 fetuses with congenital heart disease and stored for later offline examination. Both examiners correctly detected the single abnormal case of hypoplastic left-heart syndrome among the 112 unselected fetuses. Among the 10 preselected cases with congenital heart disease, examiner “A” considered 3 volumes as inadequate [2 cases of tetralogy of Fallot (TOF) and one case corrected transposition of the great arteries (TGA)], and correctly diagnosed 3 cases of TOF, 2 cases of complete TGA, and one case of interrupted aortic arch. Examiner B considered 4 of the volumes to be nondiagnostic (2 cases of TOF, one case of complete TGA, and one case of corrected TGA), missed the diagnosis of interrupted aortic arch, interpreted one case of TOF as double outlet right ventricle, and correctly diagnosed 2 cases of TOF, and 2 cases of complete TGA. Figures 12 and 13 depict the use of this technique in TOF with pulmonary atresia and complete TGA, respectively. An alternative to scrolling through the original plane of acquisition is to automatically reslice the volume dataset. This has been variously called tomographic ultrasound imaging or multislice imaging, depending on the manufacturer.38,40 Tomographic ultrasound imaging allows the examiner to simultaneously see the multiple planes of section along the original acquisition plane (or alternatively sagittal or coronal reconstructed planes) in a single screen and, therefore, may facilitate looking at the multiple facets of complex cardiac anomalies (Figure 15). Recently introduced technological developments for volume manipulation allows examiners to manually trace lines through a longitudinal view of the ductal arch in a volume dataset and obtain the standard planes of section required for a thorough examination of the fetal heart fairly consistently. Two variations of the technique have been described, the ‘FAST’ and the ‘STAR’ techniques, with illustrations of each provided in Figures 16 and 17. 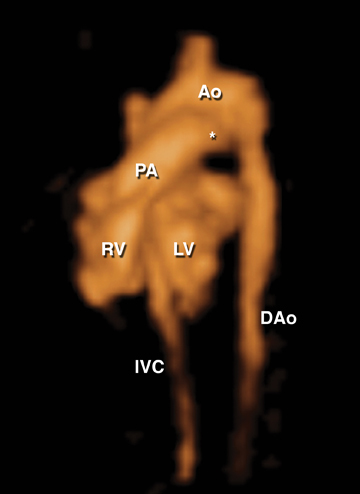 One of the unique capabilities of volumetric imaging is to allow rendered reconstruction of cardiac structures. 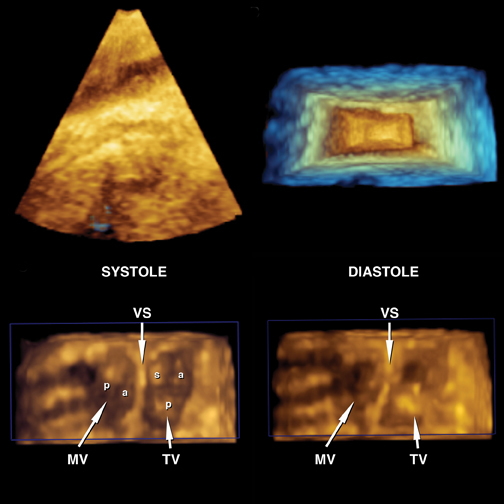 Rendered views of the great vessels can be obtained with a variety of techniques, including inversion mode for volume datasets acquired using gray scale only (Figure 18, D-TGA), color Doppler (Figures 1 and 5), power Doppler (Figure 6), and B-flow imaging (Figures 7 and 19). Prenatal diagnosis of abnormalities involving the great vessels, such as transposition of the great arteries, tetralogy of Fallot, truncus arteriosus, and double outlet right ventricle have been reported by several groups using one or more of these technologies.29,30,31,49, 50, 51-57 Of particular interest is the exquisite characterization of difficult abnormalities, such as major collateral pulmonary arteries in the setting of pulmonary atresia with VSD,32 interrupted aortic arch with associated cervical origin of the right subclavian artery,56 and total anomalous pulmonary venous return54,55 (Figure 19) that have been reported using rendered images of the fetal vessels obtained with b-flow imaging. 4D-fetal echocardiography is an emerging technology that adds to the diagnostic armamentarium of the fetal imager in the difficult task of prenatal diagnosis of congenital heart disease. Once a volume dataset of sufficient diagnostic quality is acquired and analyzed by experts, a correct diagnosis can be achieved in the majority of cases.10,12 This opens up the possibility of volume datasets of the fetal heart be used in the future for remote consultations in a telemedicine imaging environment.77-79 The bottleneck for more ample utilization of this technology in the clinical setting appears to be the inherent limitations of current ultrasound technology to deal with factors that degrade 2DUS image quality, such as fetal movement, unfavorable fetal position, anterior placenta, and maternal obesity. We hope that future developments that address these problems can eventually lead to more widespread utilization of 4DUS fetal echocardiography in clinical practice. Ferencz C, Rubin JD, McCarter RJ, et al. Congenital heart disease: Prevalence at livebirth. The Baltimore-Washington Infant Study. Am J Epidemiol. 1985;121:31-36. Mitchell SC, Korones SB, Berendes HW. Congenital heart disease in 56,109 births. Incidence and natural history. Circulation. 1971;43:323-332. Hoffman JI, Kaplan S. The incidence of congenital heart disease. J Am Coll Cardiol. 2002;39:1890-900. DeVore GR. The prenatal diagnosis of congenital heart disease--a practical approach for the fetal sonographer. J Clin Ultrasound. 1985;13:229-245. Fermont L, De Geeter B, Aubry J, Kachaner J, Sidi D. A close collaboration between obstetricians and pediatric cardiologists allow antenatal detection of severe cardiac malformations by 2D echocardiography. In: Doyle EF, Engle ME, Gersony WM, eds. Second World Congress of Pediatric Cardiology; 1985; New York: Springer-Verlag; 1985. pp. 34-37. Friedberg MK, Silverman NH, Moon-Grady AJ, et al. Prenatal detection of congenital heart disease. J Pediatr. 2009;155:26-31. Sklansky MS, Berman DP, Pruetz JD, Chang RK. Prenatal screening for major congenital heart disease: Superiority of outflow tracts over the 4-chamber view. J Ultrasound Med. 2009;28:889-899. Tegnander E, Eik-Nes SH. The examiner’s ultrasound experience has a significant impact on the detection rate of congenital heart defects at the second-trimester fetal examination. Ultrasound Obstet Gynecol. 2006;28:8-14. Carvalho JS, Mavrides E, Shinebourne EA, Campbell S, Thilaganathan B. Improving the effectiveness of routine prenatal screening for major congenital heart defects. Heart. 2002;88:387-391. Bennasar M, Martinez JM, Gomez O, et al. Accuracy of four-dimensional spatiotemporal image correlation echocardiography in the prenatal diagnosis of congenital heart defects. Ultrasound Obstet Gynecol. 2010;36:458-464. DeVore GR, Polanco B, Sklansky MS, Platt LD. The ‘spin’ technique: a new method for examination of the fetal outflow tracts using three-dimensional ultrasound. Ultrasound Obstet Gynecol. 2004;24:72-82. Espinoza J, Lee W, Comstock C, et al. Collaborative study on 4-dimensional echocardiography for the diagnosis of fetal heart defects: The COFEHD study. J Ultrasound Med. 2010;29:1573-1580. Goncalves LF, Lee W, Chaiworapongsa T, et al. 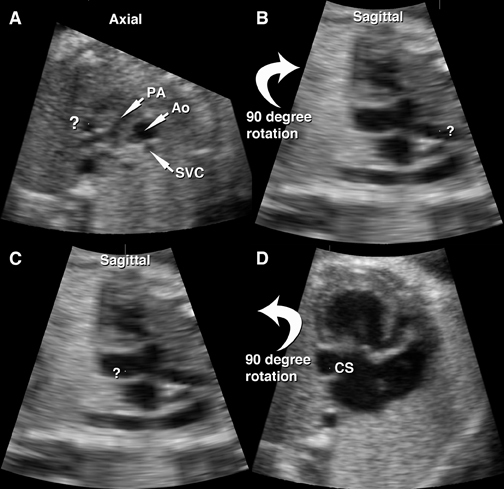 Four-dimensional ultrasonography of the fetal heart with spatiotemporal image correlation. Am J Obstet Gynecol. 2003;189:1792-1802. Paladini D, Sglavo G, Greco E, Nappi C. Cardiac screening by STIC: Can sonologists performing the 20-week anomaly scan pick up outflow tract abnormalities by scrolling the A-plane of STIC volumes? Ultrasound Obstet Gynecol. 2008;32:865-870. Rizzo G, Capponi A, Muscatello A, et al. 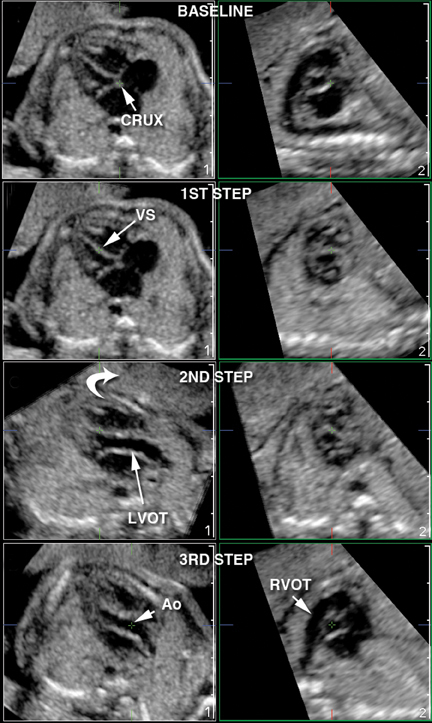 Examination of the fetal heart by four-dimensional ultrasound with spatiotemporal image correlation during routine second-trimester examination: The ‘three-steps technique’. Fetal Diagn Ther. 2008;24:126-131. Vinals F, Poblete P, Giuliano A. Spatio-temporal image correlation (STIC): A new tool for the prenatal screening of congenital heart defects. Ultrasound in obstetrics & gynecology the official journal of the International Society of Ultrasound in Obstetrics and Gynecology 2003;22:388-394. Deng J. Terminology of three-dimensional and four-dimensional ultrasound imaging of the fetal heart and other moving body parts. Ultrasound Obstet Gynecol. 2003;22:336-344. Espinoza J. Contemporary clinical applications of spatio-temporal image correlation in prenatal diagnosis. Curr Opin Obstet Gynecol. 2011;23:94-102. Nelson TR, Pretorius DH, Sklansky M, Hagen-Ansert S. Three-dimensional echocardiographic evaluation of fetal heart anatomy and function: acquisition, analysis, and display. J Ultrasound Med. 1996;15:1-9 quiz 11-2. Goncalves LF, Espinoza J, Kusanovic JP, et al. Applications of 2-dimensional matrix array for 3- and 4-dimensional examination of the fetus: A pictorial essay. J Ultrasound Med. 2006;25:745-755. Li J, Sanders SP. Three-dimensional echocardiography in congenital heart disease. Curr Opin Cardiol. 1999;14:53-59. Maulik D, Nanda NC, Singh V, et al. 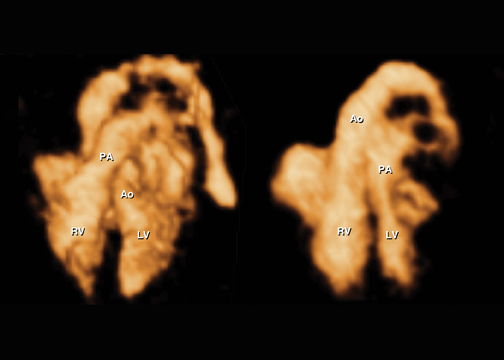 Live three-dimensional echocardiography of the human fetus. Echocardiography. 2003;20:715-721. Panza JA. Real-time three-dimensional echocardiography: An overview. Int J Cardiovasc Imaging. 2001;17:227-235. Sklansky MS, DeVore GR, Wong PC. Real-time 3-dimensional fetal echocardiography with an instantaneous volume-rendered display: Early description and pictorial essay. J Ultrasound Med. 2004;23:283-289. Sklansky MS, Nelson T, Strachan M, Pretorius D. Real-time three-dimensional fetal echocardiography: Initial feasibility study. J Ultrasound Med. 1999;18:745-752. Sklansky MS, Nelson TR, Pretorius DH. Three-dimensional fetal echocardiography: Gated versus nongated techniques. J Ultrasound Med. 1998;17:451-457. Von Ramm OT, Smith SW. Real time volumetric ultrasound imaging system. J Digit Imaging. 1990;3:261-266. DeVore GR, Medearis AL, Bear MB, Horenstein J, Platt LD. Fetal echocardiography: Factors that influence imaging of the fetal heart during the second trimester of pregnancy. J Ultrasound Med. 1993;12:659-663. Chaoui R, Hoffmann J, Heling KS. Three-dimensional (3D) and 4D color Doppler fetal echocardiography using spatio-temporal image correlation (STIC). Ultrasound Obstet Gynecol. 2004;23:535-545. Goncalves LF, Espinoza J, Lee W, et al. 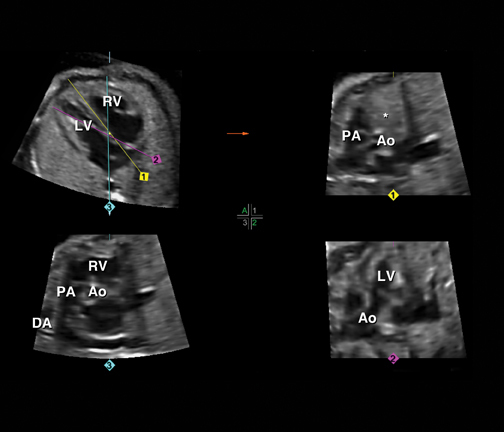 A new approach to fetal echocardiography: Digital casts of the fetal cardiac chambers and great vessels for detection of congenital heart disease. J Ultrasound Med. 2005;24:415-424. Goncalves LF, Romero R, Espinoza J, et al. 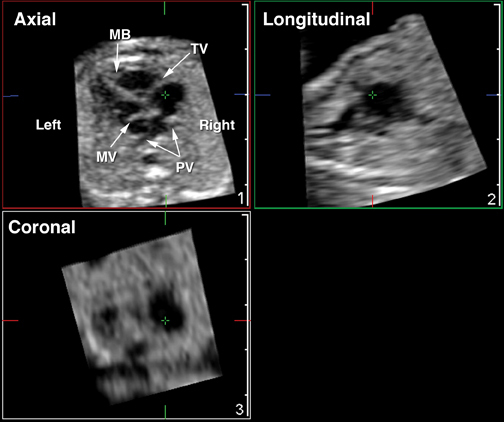 Four-dimensional ultrasonography of the fetal heart using color Doppler spatiotemporal image correlation. J Ultrasound Med. 2004;23:473-481. Volpe P, Campobasso G, Stanziano A, et al. Novel application of 4D sonography with B-flow imaging and spatio-temporal image correlation (STIC) in the assessment of the anatomy of pulmonary arteries in fetuses with pulmonary atresia and ventricular septal defect. Ultrasound Obstet Gynecol. 2006;28:40-46. Anderson RH, Becker AE, Freedom RM, et al. Sequential segmental analysis of congenital heart disease. Pediatric Cardiology. 1984;5: 281-287. Carvalho JS, Ho SY, Shinebourne EA. Sequential segmental analysis in complex fetal cardiac abnormalities: a logical approach to diagnosis. Ultrasound Obstet Gynecol. 2005;26:105-111. Shinebourne EA, Macartney FJ, Anderson RH. Sequential chamber localization--logical approach to diagnosis in congenital heart disease. Br Heart J. 1976;38:327-340. Yoo SJ, Lee YH, Cho KS, Kim DY. Sequential segmental approach to fetal congenital heart disease. Cardiol Young. 1999;9:430-444. Satomi G, Takao A. Systematic diagnostic method of two-dimensional echocardiography in congenital heart disease. Heart Vessels. 1985;1: 101-113. Devore GR, Polanko B. Tomographic ultrasound imaging of the fetal heart: A new technique for identifying normal and abnormal cardiac anatomy. J Ultrasound Med. 2005;24:1685-1696. Espinoza J, Kusanovic JP, Goncalves LF, et al. A novel algorithm for comprehensive fetal echocardiography using 4-dimensional ultrasonography and tomographic imaging. J Ultrasound Med. 2006;25:947-956. Goncalves LF, Espinoza J, Romero R, et al. Four-dimensional ultrasonography of the fetal heart using a novel tomographic ultrasound imaging display. J Perinat Med. 2006;34:39-55. Yeo L, Romero R, Jodicke C, et al. Simple targeted arterial rendering (STAR) technique: a novel and simple method to visualize the fetal cardiac outflow tracts. Ultrasound Obstet Gynecol. 2011;37:549-556. Yeo L, Romero R, Jodicke C, et al. Four-chamber view and ‘swing technique’ (FAST) echo: a novel and simple algorithm to visualize standard fetal echocardiographic planes. Ultrasound Obstet Gynecol. 2011;37:423-431. Goncalves LF, Espinoza J, Romero R, et al. Four-dimensional fetal echocardiography with spatiotemporal image correlation (STIC): a systematic study of standard cardiac views assessed by different observers. J Matern Fetal Neona. 2005;17:323-331. Espinoza J, Romero R, Kusanovic JP, et al. 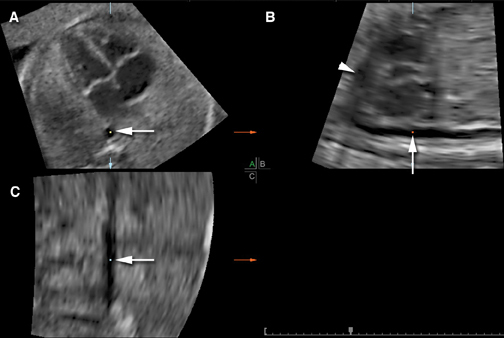 The role of the sagittal view of the ductal arch in identification of fetuses with conotruncal anomalies using 4-dimensional ultrasonography. J Ultrasound Med. 2007;26:1181-8; quiz 9-90. Espinoza J, Gotsch F, Kusanovic JP, et al. Changes in fetal cardiac geometry with gestation: Implications for 3- and 4-dimensional fetal echocardiography. J Ultrasound Med. 2007;26:437-443; quiz 44. Abuhamad A, Falkensammer P, Reichartseder F, Zhao Y. 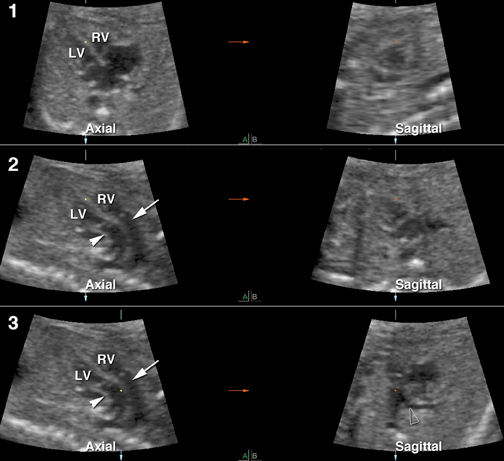 Automated retrieval of standard diagnostic fetal cardiac ultrasound planes in the second trimester of pregnancy: a prospective evaluation of software. Ultrasound Obstet Gynecol. 2008;31:30-36. Tutschek B, Sahn DJ. Semi-automatic segmentation of fetal cardiac cavities: progress towards an automated fetal echocardiogram. Ultrasound Obstet Gynecol. 2008;32:176-180. Rizzo G, Capponi A, Cavicchioni O, Vendola M, Pietrolucci ME, Arduini D. Application of automated sonography on 4-dimensional volumes of fetuses with transposition of the great arteries. J Ultrasound Med. 2008;27:771-776; quiz 7. Espinoza J, Goncalves LF, Lee W, Mazor M, Romero R. A novel method to improve prenatal diagnosis of abnormal systemic venous connections using three- and four-dimensional ultrasonography and ‘inversion mode’. Ultrasound Obstet Gynecol. 2005;25:428-434. Espinoza J, Romero R, Kusanovic JP, et al. Prenatal diagnosis of coarctation of the aorta with the multiplanar display and B-flow imaging using 4-dimensional sonography. J Ultrasound Med. 2009;28:1375-1378. Goncalves LF, Espinoza J, Romero R, et al. A systematic approach to prenatal diagnosis of transposition of the great arteries using 4-dimensional ultrasonography with spatiotemporal image correlation. J Ultrasound Med. 2004;23:1225-1231. Hata T, Dai SY, Inubashiri E, et al. Four-dimensional sonography with B-flow imaging and spatiotemporal image correlation for visualization of the fetal heart. J Clin Ultrasound. 2008;36:204-207. Hata T, Tanaka H, Noguchi J, Dai SY, Yamaguchi M, Yanagihara T. Four-dimensional volume-rendered imaging of the fetal ventricular outflow tracts and great arteries using inversion mode for detection of congenital heart disease. J Obstet Gynaecol Res. 2010;36:513-518. Lee W, Espinoza J, Cutler N, Bronsteen RA, Yeo L, Romero R. The ‘starfish’ sign: a novel sonographic finding with B-flow imaging and spatiotemporal image correlation in a fetus with total anomalous pulmonary venous return. Ultrasound Obstet Gynecol. 2010;35:124-125. Volpe P, Campobasso G, De Robertis V, et al. 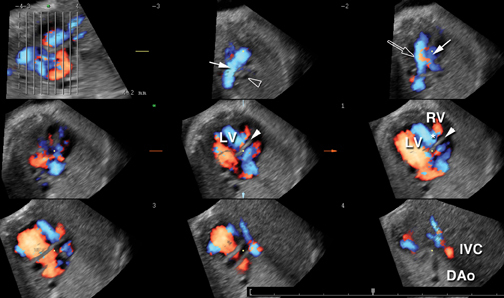 Two- and four-dimensional echocardiography with B-flow imaging and spatiotemporal image correlation in prenatal diagnosis of isolated total anomalous pulmonary venous connection. Ultrasound Obstet Gynecol. 2007;30:830-837. Volpe P, Tuo G, De Robertis V, et al. 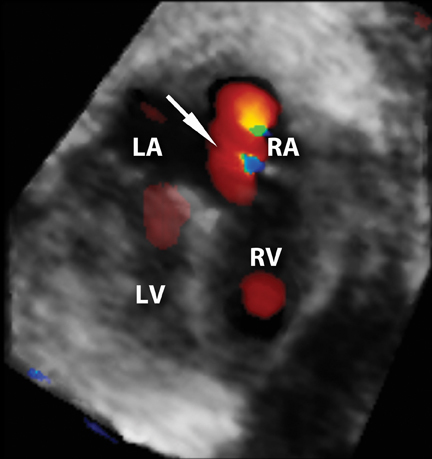 Fetal interrupted aortic arch: 2D-4D echocardiography, associations and outcome. Ultrasound in obstetrics & gynecology : the official journal of the International Society of Ultrasound in Obstetrics and Gynecology 2010;35:302-309. Zhang M, Pu DR, Zhou QC, Peng QH, Tian LQ. Four-dimensional echocardiography with B-flow imaging and spatiotemporal image correlation in the assessment of congenital heart defects. Prenatal Diagnosis. 2010;30:443-448. Bhat AH, Corbett VN, Liu R, et al. Validation of volume and mass assessments for human fetal heart imaging by 4-dimensional spatiotemporal image correlation echocardiography: in vitro balloon model experiments. J Ultrasound Med. 2004;23:1151-1159. Hamill N, Romero R, Hassan SS, et al. 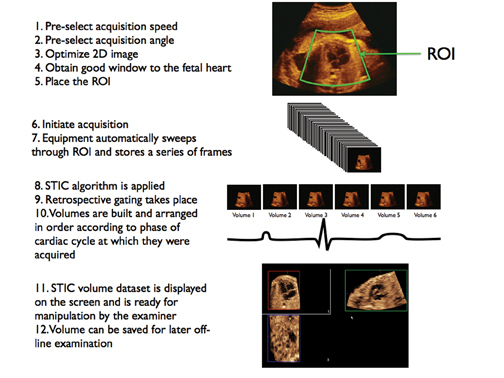 Repeatability and reproducibility of fetal cardiac ventricular volume calculations using spatiotemporal image correlation and virtual organ computer-aided analysis. J Ultrasound Med. 2009;28:1301-1311. Hamill N, Yeo L, Romero R, et al. Fetal cardiac ventricular volume, cardiac output, and ejection fraction determined with 4-dimensional ultrasound using spatiotemporal image correlation and virtual organ computer-aided analysis. Am J Obstet Gynecol. 2011;205:76 e1-10. Messing B, Cohen SM, Valsky DV, et al. 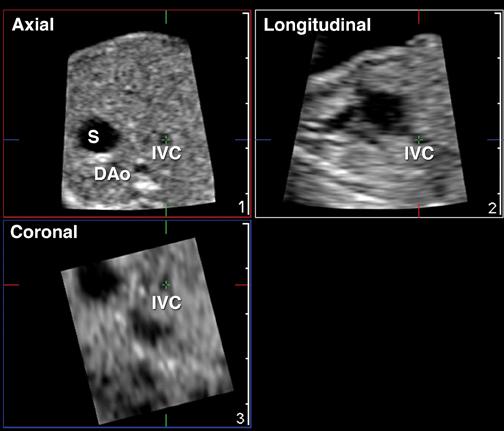 Fetal cardiac ventricle volumetry in the second half of gestation assessed by 4D ultrasound using STIC combined with inversion mode. Ultrasound Obstet Gynecol. 2007;30:142-151. Messing B, Cohen SM, Valsky DV, et al. 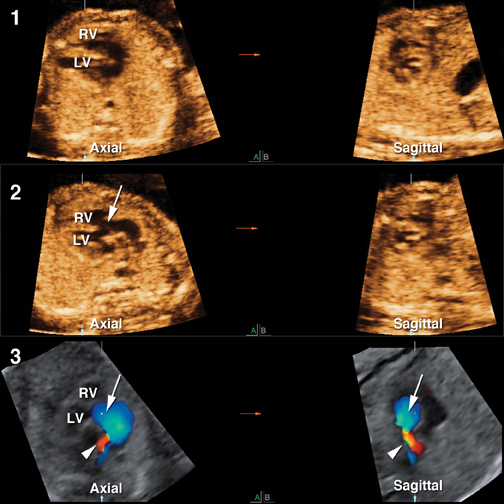 Fetal heart ventricular mass obtained by STIC acquisition combined with inversion mode and VOCAL. Ultrasound Obstet Gynecol. 2011;38:191-197. Molina FS, Faro C, Sotiriadis A, Dagklis T, Nicolaides KH. Heart stroke volume and cardiac output by four-dimensional ultrasound in normal fetuses. Ultrasound Obstet Gynecol. 2008;32:181-187. Rizzo G, Capponi A, Cavicchioni O, Vendola M, Arduini D. Fetal cardiac stroke volume determination by four-dimensional ultrasound with spatio-temporal image correlation compared with two-dimensional and Doppler ultrasonography. Prenatal Diagnosis. 2007;27:1147-1150. Rizzo G, Capponi A, Pietrolucci ME, Arduini D. Role of sonographic automatic volume calculation in measuring fetal cardiac ventricular volumes using 4-dimensional sonography: Comparison with virtual organ computer-aided analysis. J Ultrasound Med. 2010;29:261-270. Schoonderwaldt EM, Groenenberg IA, Hop WC, Wladimiroff JW, Steegers EA. Reproducibility of echocardiographic measurements of human fetal left ventricular volumes and ejection fractions using four-dimensional ultrasound with the spatio-temporal image correlation modality. Eur J Obstet Gynecol Reprod Biol. 2011. Simioni C, Nardozza LM, Araujo Junior E, et al. Fetal cardiac function assessed by spatio-temporal image correlation. Arch Gynecol Obstet. 2011;284:253-260. Simioni C, Nardozza LM, Araujo Junior E, et al. Heart stroke volume, cardiac output, and ejection fraction in 265 normal fetus in the second half of gestation as-sessed by 4D ultrasound using spatiotemporal image correlation. J Matern Fetal Neona. 2011;24:1159-1167. Tongprasert F, Srisupundit K, Luewan S, et al. Reference ranges of fetal aortic and pulmonary valve diameter derived by STIC from 14 to 40 weeks of gestation. Prenatal Diagnosis. 2011;31:439-445. Traisrisilp K, Tongprasert F, Srisupundit K, Luewan S, Tongsong T. Reference ranges for the fetal cardiac circumference derived by cardio-spatiotemporal image correlation from 14 to 40 weeks’ gestation. J Ultrasound Med. 2011;30:1191-1196.
imaging and spatiotemporal image correlation. Ultrasound Obstet Gynecol. 2010;35:324-331. Uittenbogaard LB, Haak MC, Spreeuwenberg MD, van Vugt JM. Fetal cardiac function assessed with four-dimensional ultrasound imaging using spatiotemporal image correlation. Ultrasound Obstet Gynecol. 2009;33:272-281. Uittenbogaard LB, Haak MC, Tromp CH, Terwee CB, Van Vugt JM. Reliability of fetal cardiac volumetry using spatiotemporal image correlation: Assessment of in-vivo and in-vitro measurements. Ultrasound Obstet Gynecol. 2010;36:308-314. Uittenbogaard LB, Haak MC, Spreeuwenberg MD, Van Vugt JM. A systematic analysis of the feasibility of four-dimensional ultrasound imaging using spatiotemporal image correlation in routine fetal echocardiography. Ultrasound Obstet Gynecol. 2008;31:625-632. Cohen L, Mangers K, Grobman WA, Platt LD. Satisfactory visualization rates of standard cardiac views at 18 to 22 weeks’ gestation using spatiotemporal image correlation. J Ultrasound Med. 2009;28:1645-1650. Yagel S, Cohen SM, Rosenak D, et al. Added value of three-/four-dimensional ultrasound in offline analysis and diagnosis of congenital heart disease. Ultrasound Obstet Gynecol. 2011;37:432-437. Vinals F. Current experience and prospect of internet consultation in fetal cardiac ultrasound. Fetal Diagnosis and Therapy. 2011;30:83-87. Vinals F, Ascenzo R, Naveas R, Huggon I, Giuliano A. Fetal echocardiography at 11 + 0 to 13 + 6 weeks using four-dimensional spatiotemporal image correlation telemedicine via an Internet link: A pilot study. Ultrasound Obstet Gynecol. 2008;31:633-638. Vinals F, Mandujano L, Vargas G, Giuliano A. Prenatal diagnosis of congenital heart disease using four-dimensional spatio-temporal image correlation (STIC) telemedicine via an Internet link: A pilot study. Ultrasound Obstet Gynecol. 2005;25:25-31. 3D-4D fetal echocardiography. Appl Radiol.